The 18-hole, Par 71 Arthur Hills designed golf course meanders through pristine wetlands surrounded by the natural beauty of majestic oaks and towering pines. A complete golf practice facility equipped with a natural grass driving range, a chipping and a putting green is located near the club house. 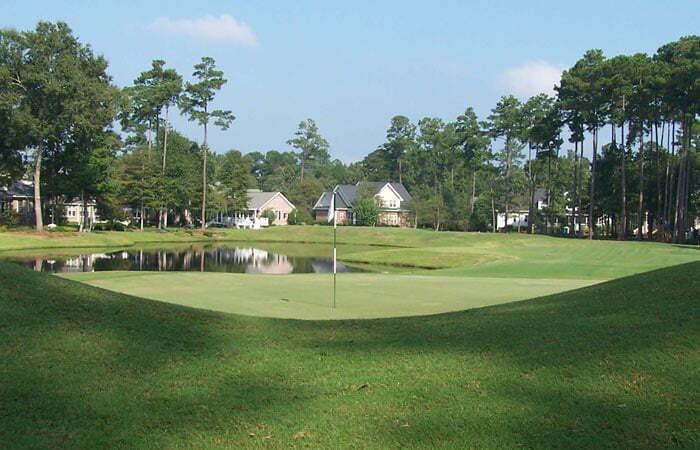 Coosaw Creek Country Club is located 5 miles off of Interstate 26 in North Charleston. Directions: I-95 South to I-26 East towards Charleston. Take Exit 209 onto Ashley Phosphate Rd. Heading West for approx. 5 miles. Turn right onto Dorchester Rd. at the 2nd stoplight, turn right onto Club Course Dr. continue through the 4-way stop into the community. Features: Full-service Clubhouse, Locker rooms, Dining area and the Palmetto Grill, Driving range with a pitching green, putting green, and bunker. Dress Code: Dress code is enforced on the practice range and golf course. No denim is allowed. Men must have a collared shirt, and ladies must have a collar or sleeves on their shirt. Cooler Policy: No Private Coolers are allowed. Pace of Play: Our pace of play is 4 hours. Only one cart is permitted for groups of 2, no more than 2 carts for groups of 3 or 4. No fivesomes are allowed. Each player must have their own set of clubs. All players are responsible for their own safety on the course. There is no warning system.